The Royal Canadian Sea Cadets is a civilian program for girls and boys between the ages of 12 and 18. Sea Cadets come from different backgrounds, but all share a common interest. Royal Canadian Sea Cadets from across the country learn about the naval and maritime environment by participating in a variety of activities on and off the water. The program provides opportunities for young Canadians to learn new skills, make friends, and become active citizens in their communities. More than 7,000 Sea Cadets are located in 237 communities across Canada. For Julie Rivard, the Sea Cadet program was much more than an extracurricular activity. On her twelfth birthday, Julie’s parents encouraged her to enroll in the Royal Canadian Sea Cadet Corps in Rimouski, Quebec. After her first night of training with the Cadet corps, it was obvious by her smile that she had enjoyed the experience. Julie instantly became a loyal and dedicated member of the program. During her formative years, Rivard learnt about nautical regulations, how to sail, and prepare for seamanship competitions. Through the Sea Cadet program, she also had the opportunity to teach Cadets, lead groups, and resolve conflicts. Julie also took it upon herself to obtain several certifications. Julie took courses to acquire her St John Ambulance Canada first aid certificate, her Pleasure Craft Operator Card (PCOC), and her Restricted Radiotelephone Operator’s Certificate (ROC). For Julie Rivard, Cadet training had given her many opportunities to grow and learn. She attended many summer training camps and made several friends from other corps. Ultimately, Julie enjoyed the hands-on activities and exciting challenges the Royal Canadian Sea Cadet program offered. In 2012, at the age of 14, Julie and her family moved to Lévis, Quebec. Shortly thereafter, Rivard joined the Cadet corps of Pointe-Lévy. She noted, “the moving experience was made easier in Lévis thanks to the Cadet program.” That same year, Julie received the Navy League of Canada Commendation and the Queen Elizabeth II Diamond Jubilee Medal. The Navy League of Canada noted Julie Rivard’s passion for the Royal Canadian Sea Cadet Program. In January 2017, Rivard received the highly coveted badge for the position of coxswain and the rank of Chief Petty Officer 1st class. Later that year, the Navy League of Canada awarded CPO1 Rivard the Navy League of Canada Medal of Excellence. 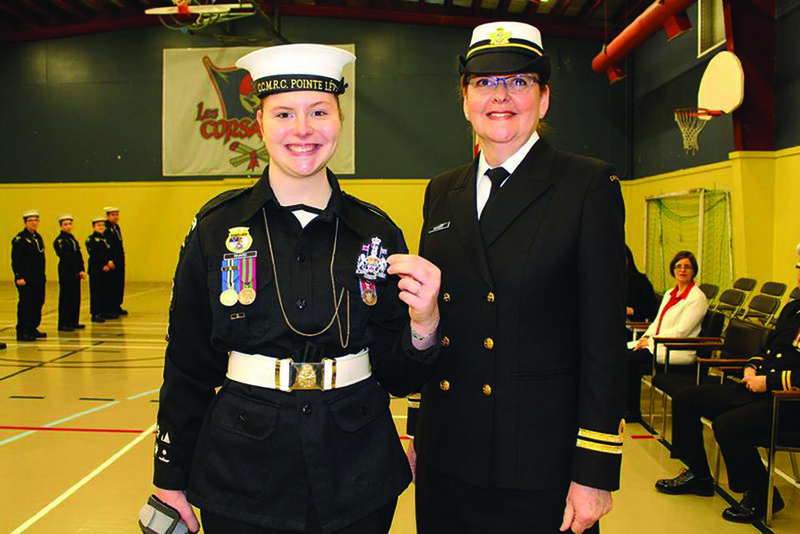 Julie’s perseverance, courage and dedication to the Sea Cadet program earned her this award. After aging out of the Royal Canadian Sea Cadet program, former Cadet Rivard received a $5,000 scholarship from the Young Citizens Foundation in 2018. Each year, the Navy League of Canada, in collaboration with the Young Citizens Foundation, awards this scholarship to a deserving Cadet who demonstrates a high level of citizenship with the desire to pursue post-secondary education. self-confidence. An exemplary role model to fellow Sea Cadets; faithful, courageous and determined, Julie Rivard is an incredible individual. We are grateful to have been able to work with a Cadet like Julie Rivard and wish her every success in her future adventures.